Shop Demo Model #113 (has a few very minor superficial scratches). • 2 in One Guitar + Stereo. A full warm sounding acoustic & a full blown crunching electric in one. 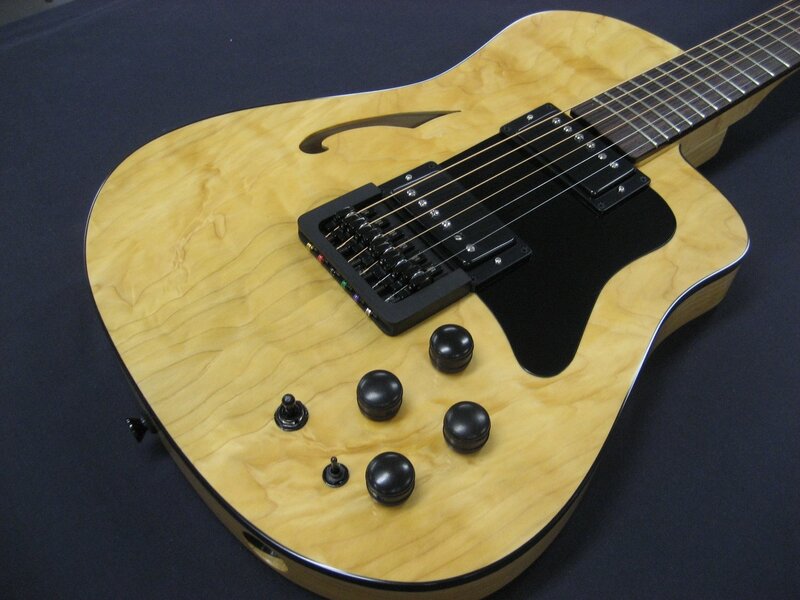 Imagine having 2 guitars in 1 & switchable from one to another or both in stereo. • Two Custom Hand Wound Lindy Fralin Coil Tapped FR Humbucker Pickups More power, Longer sustain and Faster grind. Wound with 43 gauge wire with Alnico IV Magnets. Tolerates being turned down on the volume control (with no loss of crunch) & custom setup for your type of strings, if desired. • Exclusive Designed Controls- 17 switchable pickup variations, wired in stereo with Acoustic & Electric signals splittable to separate amps and/or mixer channels. • Dims: 2x13x38” - Weight Apx. 8lbs.